On October 2, the Northeast Ohio Regional Sewer District (Sewer District) Board of Trustees approved a $3,000,000 installment grant for the Public Square Renovation Project. "Public Square is the heart of Downtown Cleveland," said Julius Ciaccia, Executive Director of the Sewer District. "We're excited to be able to connect our clean water work to the renovation of this historic, popular and heavily-traveled area." The Public Square Renovation Project includes a $7 million investment in green infrastructure, which will remove approximately 3 million gallons of storm water yearly from the combined sewer system. Visible features will include additional trees, permeable pavers, and storm water planters. Below grade, a rainwater harvesting system will collect run-off to be used for all on-site watering needs. "As it exists today, Public Square is 60 percent hardscape,' said Frank Greenland, Sewer District Director of Watershed Programs. 'The new design increases greenspace on Public Square by 30 to 40 percent, and 35 percent of the area will be permeable for storm water. This will help reduce the amount of flow coming into our Westerly and Easterly Wastewater Treatment Plants." This investment complements the Sewer District's Project Clean Lake program, which is designed to reduce combined sewer overflows, a combination of sewage and storm water discharging into the environment, from 4.5 billion gallons to 500 million gallons. 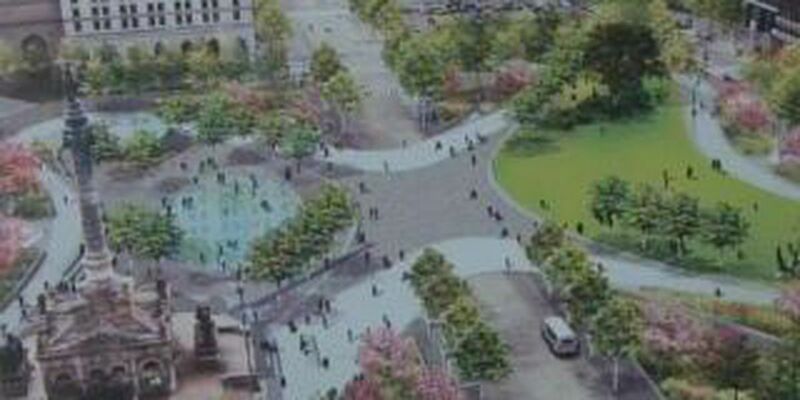 "The transformation of Public Square is an investment in our core infrastructure that will redefine downtown Cleveland," said Jeremy Paris, executive director of the Group Plan Commission, a 501 (c)(3) organization established by the City of Cleveland and its partners to guide the renovation, and long-term programming, operation, and maintenance of the restored Public Square. "The design is built around sustainability and underscores the importance of green infrastructure. A collaborative civic partnership has driven this effort. We are thrilled to add the NEORSD as a lead partner that will help make this vision of a greener Cleveland a reality." In addition, the Sewer District and the Group Plan Commission will coordinate clean-water messaging and programming throughout Public Square. '"Investments in projects like the Public Square Renovation Project give our organization an opportunity to share its clean water message," said Constance Haqq, Sewer District Director of Administration and External Affairs. "We're excited to have such a public forum to convey the work we're doing to keep our Great Lake great."